Deviled, Boiled, Fried… Eggs – Olive For Greens. If you read my “Taking a Break-Fast!” blog then you know how much I loved eggs. Diners cross America are egg crazy-seemingly. Statically, Americans eat over 200 eggs per year. That is a lot of eggs! But what do you know about them besides the fact that chickens lay them? Heck, we don’t even know which came first! Don’t expect the answer here, because I have no idea! But I know a thing or 2 about eggs I want to share. 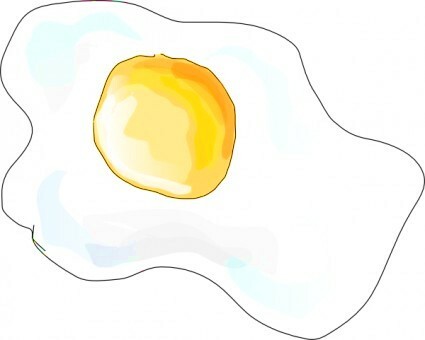 Eggs are loaded with protein, D vitamin and B vitamins- just to name a few. However, not all eggs are created the same. There are “regular” eggs with no label on the packing while others are labeled cage-free and organic. So which is best? The best, healthiest, eggs can come from a farmers market. These eggs can ensure the most nutrition. The next best, in my opinion, would be organic eggs. There are so many facts out there about eggs so at the end of the day, we believe what we want about them. You might be thinking “I can eat eggs whenever I want!” Although that is true, there is a better time of day to eat eggs. Most people eat eggs at breakfast time- just like I used to. But now the only time, the best time, I eat eggs is at dinner time. Why? Because eggs, like all animal products, are heavy and take longer to digest. Most of us are trained to believe the heaviest meal should be eaten at lunch time. But if you ask yourself “why” you might not know that answer. I don’t know either! Some people may say because we can “burn them off during the day”. Although that could be true how true is that to a person with a sedentary job? Not very. Our heaviest meals, and food choices, should be at dinner time so that way we have hours to digest it- from the time we finish dinner plus the overnight hours we sleep. That’s over 8 hours of digestion (for most of us! Please note hours of digestion may vary!). As I’ve said before, I rarely eat eggs. But rarely does mean never! When I mentioned above, not to eat eggs until dinner, I didn’t just mean have breakfast for dinner, although you could! 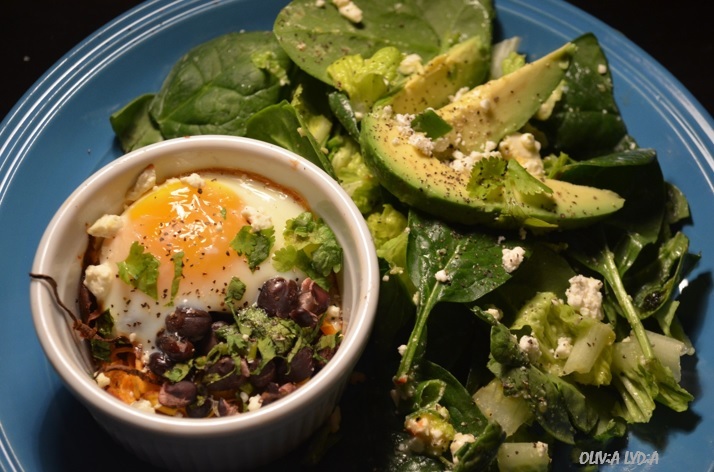 There are plenty of other ways to have eggs for dinner. Deviled eggs are one option. Even a poached egg with your meal is good. This time I baked mine. 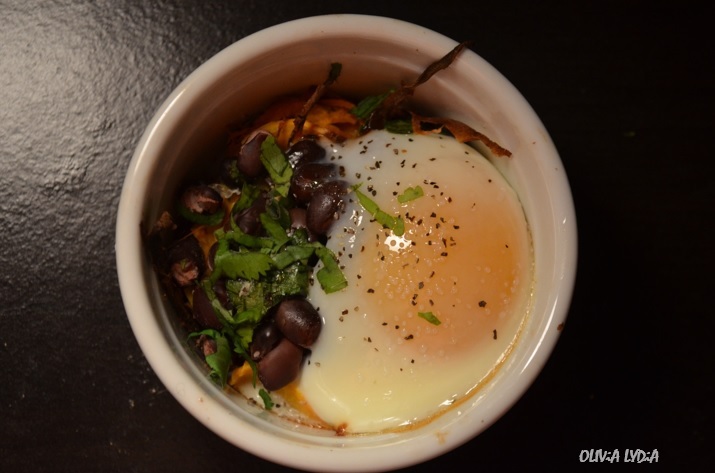 In this meal, sweet potatoes are shredded in a bowl, topped with a black bean salad and an egg. I can hardly believe, I created this. I hope you try it and enjoy! Note: Makes 8 1-cup ramekins. For 4 1-cup ramekins, use 1 small potatoes and ½ of the ingredients below. 1 person can eat up to 2. Pre-heat the oven to 400 degree Fahrenheit. Mix melted coconut oil, a pinch of salt and potatoes. Divide the potatoes in the ramekins-stuffed ¾ of the way up. Bake for 30 minutes. Meanwhile, in a bowl, mix the black beans, lime juice, honey, cilantro, scallions and garlic. Set aside. After 30 minutes, potatoes should be golden, remove ramekins from the oven. Top the potatoes with bean mixture. Crack 1 egg in the ramekin over the bean mixture. Sprinkle with salt. Place ramekin back in the oven for 8-12 minutes, depending on how soft you like your yolk. Romaine and spinach salad with sofrito vinaigrette (click here for dressing recipe). Add avocado slices and feta. Romaine-spinach salad with sofrito vinaigrette topped avocado slices & feta.